Cleaning your windows is one of the quickest and most productive ways of adding a touch of elegance to your home or office. With our professional window service, you get a clean, beautiful shine without the tedious work. When you want to brighten your home or business, call our professionals at 254-716-8685 to discuss all of the benefits of window washing in Waco and Temple, TX. 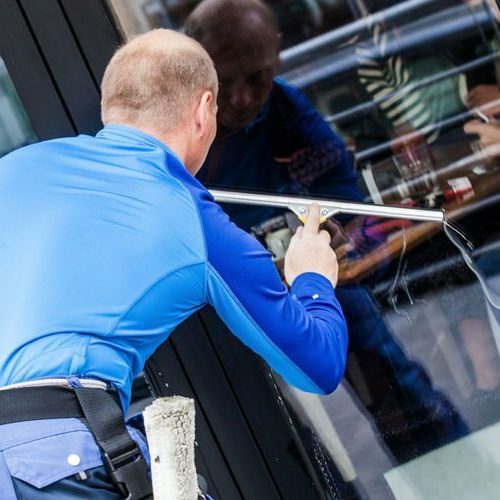 Whether you have a small corner space in a shopping center or you own an entire high rise in the city, your business can benefit from window washing. Our cleaning service will take care of dust, dirt, calcium stains, and smog. Our OSHA-certified equipment and knowledgeable team can deliver speedy, reliable service that leaves your business in a fresh new light. Experience the difference clean windows can make in Waco and Temple, TX with window washing by the experienced technicians of eSquared Asphalt Maintenance. If you’re like most homeowners, cleaning your windows is a chore you don’t look forward to. You have tried rolls and rolls of paper towels, the newspaper that crumples and makes a soggy mess, and window cleaner after window cleaner. You may have even tried the “flood it with the hose” technique that never seems to accomplish anything. All of these methods are tedious, frustrating, and never seem to work. Let our technicians perform your home’s window washing with professional techniques and equipment to deliver an impeccable shine that lasts. We thoroughly clean your entire window, along with your tracks and seals. We clean and treat your screens and glass to prevent new dirt from sticking and keep your windows clean longer. Your windows are one of the cornerstones of your building. Keep them beautiful and radiant with our professional window washing in Waco and Temple, TX. We can even establish a window washing schedule that can be created alone or in partnership with other services such as exterior washing and concrete maintenance. To find out more about beautification services provided by our technicians, call us at 254-716-8685 to speak with a consultant. Updated on March 21, 2019 at 10:31 am by eSquared Asphalt Maintenance.